Macintel PowerBooks, Widescreen iBook Sooner Than We Thought? "Apple's notebook lines look set to spearhead the Mac maker's shift to Intel processors next year, with the launch of updated PowerBooks and iBooks coming in the Q1/Q2 2006 timeframe. "So claimed 'extremely reliable sources', cited by AppleInsider, though the report is short on detail. "Alas, the report reckons there will be no replacements for the compact and Register-favoured 12in PowerBook G4. "One ray of light is the anticipated widescreen iBook, which has been rumoured to be in the pipeline since April 2005, when Taiwanese contract manufacturer sources said Apple had been out looking for a partner to produce the machine." Link: Intel-Based PowerBooks; Widescreen iBook; Sooner Than We Thought? "Most deep-geeks I know now use an Apple. Maybe not as their daily driver when forced by work to use a Windows machine, but two CSO's I know have admitted to me when I've opened my PowerBook in front of them 'Oh, I'll never buy anything else with my own money'. PowerBook adoption is also inevitable due to the status symbol factor. It's like a friend that chartered the adoption of OS X in a big ol' chemical company told me, 'when I opened my PowerBook up in a meeting for the first time, it was uncomfortable, because it was like having a key to the executive washroom - everyone thought that the PowerBook was a sign of, well, power - those who were upwardly mobile got PowerBooks and the rest of you saps are stuck with crappy plastic Dell boxes.'" "After last week's article on PowerBook AC adapters was published (see 'Comparing Three AC Adapters' in TidBITS-803), I've received several messages from people about the MadsonLine MicroAdapter and the Macally adapter - specifically, about the amount of power they provide. "I wrote that the MicroAdapter wasn't recommended for use with newer PowerBooks (the 1 GHz PowerBook G4 Titanium, and all of the 15-inch and 17-inch PowerBooks) because it provides only 45 watts of power, compared with the 65 watts provided by the adapter Apple ships. Several people wrote in to say they were, in fact, using the MicroAdapter with those machines, and that it appeared to work fine...."
"If you're constantly partial charging your 'Book, each of these counts toward your total cap of charges before the performance of your battery begins to drop off. "I avoid this unnecessary battery abuse by running my PowerBook battery down to empty as often as possible and when a battery dies I charge it in my groovy external battery charger from NewerTech." Hardmac's Gui92 has posted a step-by-step tutorial to turn your 12" iBook into a 12" PowerBook killer. "The iBook 12" is an excellent compromise between mobility, robustness, performance and price. It can also be transformed to become a strong competitor for its brother, the PowerBook 12". However, it is impossible to equip the iBook 12" as a PowerBook 12" via the BTO from the Apple Store. So, it can be tempting to buy a basic iBook 12" model and upgrade it yourself into a highly performing mobile computer. This article is intended to provide you help to perform such transformation. This transformation is not a 'piece of cake', and requires skills, knowledge and tools. So read this article many times to ensure that you understand properly each step and the action performed. If you have a doubt, do not start! 1x iBook G4/12" 1.2 GHz or 1.33 GHz standard (256 /30 /Combo/Airport Extreme). 1x SuperDrive 8x Matshita UJ-845S multi-formats (-RAM, -R, -RW, +R, +RW). 1x HD Hitachi 80 GB 7200 rpm 8 MB cache (HTS721080G9AT00). 1x very small screw intended to fix the BT module to the motherboard (not necessarily provided with the BT kit). 1x 1 GB of DDR SDRAM SODIMM PC2100 or PC2700 (CAS 25330). "In announcing the latest changes to its PowerBook family, Apple highlighted the new models' higher-resolution screens and longer battery life but made no mention of their lower prices. Indeed, base prices for each of the three models haven't changed. But because the company has amplified the base configurations - with brand-new features and others previously available only at extra cost - the machines are now better values than ever." "Even though PowerBook performance has been lagging, it's interesting to see how far it's come in two years." PR: Adds complete "DIY" upgrade kits to its popular line of Apple PowerBook G3 based upgrades. Daystar Technology has announced the expansion of its XLR8 MAChSpeed G4 Lombard product offering. This new offering allows owners of the PowerBook G3 Series (Bronze Keyboard) USB - M5343, often referred to as the "Lombard", to upgrade onsite. The new product offering allows customers to upgrade in a few minutes, without any substantial downtime. No need to send their systems out, no need to ship their existing card out. "Our G4 upgrade transforms the Lombard into an excellent OS X performer," says Gary Dailey, president of Daystar. "The addition of our zero-downtime kits, delivers a simple and fast worldwide solution for extending the life of the user's current PowerBook." XLR8 MAChSpeed Control CPU Software. Daystar Modified High-Performance Metal Heat Sink. Arctic Silver Premium Thermal Compound. The kit also includes a rebate, form which allows customers to send the old CPU, EMI Shield and Heat Sink back to Daystar. In return, Daystar sends them a rebate check for $55 US. The Total Cost of the Upgrade, Before the Rebate is $299 (Users can take advantage of the $55 rebate after upgrading... a net cost of $244). PR: Targus, Inc., maker of the world's best-selling notebook cases and accessories, today launched the Urban series of laptop cases with an edgier look and feel, aimed towards young professionals. The four styles in the Urban collection include the Urban Messenger, Urban Topload, Urban Backpack and Urban Travel Roller. Targus has coupled brighter colors with an urban-like design to offer young professionals an alternative to the traditional, uniform notebook cases. "The Urban collection's edgier appeal offers a unique and stylish alternative in the marketplace for young professionals carrying notebooks," said Steven Robert, Targus general manager. "We created a more trendy and fashionable line of cases to appeal to the young professional's desire for design and functionality, featuring vibrant colors and personalized pockets that carry a notebook and all essential mobile accessories." 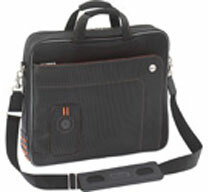 Targus personalized the Urban collection to include pockets to accommodate the accessories and consumer electronics products typically carried in a young professional's notebook case, such as an iPod, six-slot CD/DVD holder, removable accessory pouch, and key holder. The custom iPod/MP3 pocket includes a headphone port for added convenience. All four styles feature fashionable silhouettes, designed with padded interior compartments lined with a soft, scratch-resistant fabric to protect notebooks with up to 15.4" screen sizes. The cases are made from quality nylon with rugged, weather-resistant bottoms, and are lightweight. The Urban Messenger is top loading for easy access to the notebook compartment and includes a removable padded slipcase and file section, as well as pen/pencil holders, ID holder, key clip, headphone port, six-slot CD/DVD sleeve and removable accessory pouch. 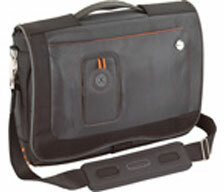 The ergonomically designed handles and padded, slip-resistant shoulder strap allow maximum comfort and versatility. External dimensions are 16.5" x 4.25" x 12.25" and the weight is 3.31 lbs. MSRP is $59.99. Organization is made easy with a padded notebook compartment, separate file sections, ID holder, pen/pencil holders, key clip, headphone port, six-slot CD/DVD sleeve and removable accessory pouch. Designed to enhance the safety of digital devices, this case also includes an easy-access compartment for an iPod or MP3 Player. The Urban Topload can attach to luggage with a pass-through trolley sleeve for added convenience while traveling. External dimensions are 16.5" x 4.25" x 12.25" and the weight is 3.31 lbs. MSRP is $69.99. Functional, fashionable and fun, the Urban Backpack is ideal for busy young professionals with many electronic accessories. Equipped with dual side pockets for carrying an iPod or MP3 Player and a mobile phone, the Urban Backpack also offers internal mesh pockets for notebook cables and accessories. The ergonomically designed shoulder strap and chest straps ensure maximum comfort while on the go. External dimensions are 15.75" x 8.5" x 17.75" and the weight is 3.31 lbs. MSRP is $69.99. The Targus Urban Travel Roller is an all-in-one travel case, designed with a separate, padded easy-access notebook compartment in the storage area to provide the ultimate in protection. A spacious inner compartment easily accommodates clothing and overnight personal items. Front zippered pockets feature custom compartments for accessories such as a mobile phone, ID, files and electronic devices. The Urban Travel Roller's lightweight design makes traveling easier with a telescoping handle and inline skate wheels that deliver smooth performance. External dimensions are 16" x 8.26" x 19.5" and the weight is 8.82 lbs. MSRP is $119.99. Each case in the Urban collection includes a lifetime-limited warranty. PR: Capacity Meter displays and tracks information about your PowerBook's battery, including capacity, amperage, current, and voltage. Using this information and your machine's specifications, Capacity Meter will let you know the current status of your battery and track degradation over time. Requirements: Mac OS X 10.1 or later, PowerBook G3 or later. "The adoption of LEDs as a backlight source for 12- and 14-inch notebooks should begin in the second quarter of 2006, when the price gap between CCFL- (cathode fluorescent lamp) and LED-based backlight modules narrows to less than NT$100 (US$3), according to LED maker Everlight Electronics. "Compared to CCFLs, LED backlighting has various advantages for notebook use, including slimmer profile, less power consumption, and mercury-free requirement in line with the EU's Restriction of Hazardous Substances (RoHS) legislation that will take effect on July 1, 2006. In order to reach equal brightness as CCFL backlighting, a 12-inch notebook needs about 45 white LEDs and 2,400 RGB LEDs for a 32-inch LCD monitor...."
"Currently, demand for 2.5-inch drives is exceeding supply by about 25%, Toshiba Taiwan indicated. The gap will likely expand in the fourth quarter of this year, when notebook shipments peak on seasonal effects...."